First off, if you haven’t seen the film, don’t watch this video. Just go borrow, rent, or even buy a copy of this amazing horror film, and come back to let this scene sink in. Go on. Do it! … NOW! This is one of my favorite horror films. Hands down. And this scene is quite possibly the best in the entire film. Though the video quality is crude in the stream, if you’ve made it this far, then you’ve seen it and know that this is just how the film looks. (And if you didn’t, you’re a stinking liar!) This English-made horror film was made using a Canon XL-1 digital camera, which was first produced in 1997 and continued to be in production until 2001, just one year before this film’s release. Director Danny Boyle (Slumdog Millionaire, 127 Hours, Trainspotting) deliberately chose this aging technology to give the relatively low-budget film its distinctive, gritty look. The setting of the film is, as you may have guessed, 28 days after a devastating plague swept through England. Jim (Cillian Murphy, Batman Begins, Inception) is a London courier who was previously struck by a car on his route and plunged into a deep coma before the world came crumbling down around him. The world he awakens to is vacant madness, as the hospital he finds himself in is trashed and abandoned. He cries out for anyone still around. He’s weak and disoriented and hasn’t eaten for quite a while. Some sugary sodas give him some strength as he leaves the hospital, only to find more emptiness. London has been abandoned completely, with not a soul in sight. His cries go unanswered as debris gives him a hint as to what has happened. Missing people. Vigils for those departed. Old newspapers telling of a mysterious infestation. This scene was filmed in the early hours of the morning. The story goes that it was so early, the filmmakers were able to capture it all while police barely had to block traffic to create the eerie effect of having a completely motionless London. 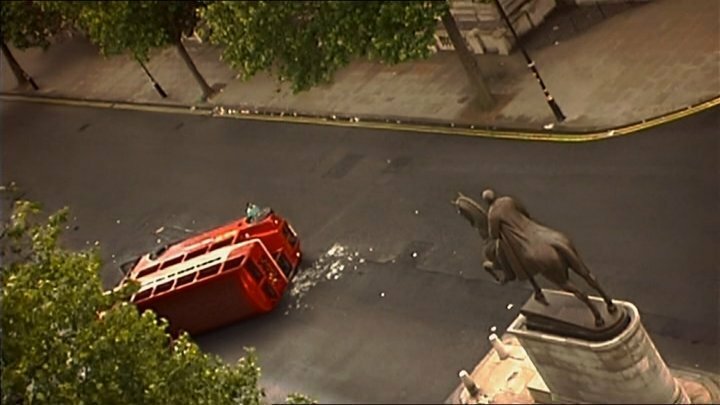 The toppled bus was placed, filmed, and returned to normal within 20 minutes, which is made all the more impressive when you consider that London is pretty much England’s New York City. If you thought that the silent nature of New York City was creepy in I Am Legend, then you’re going to be completely blown away by this green screen and visual effects-free scene. It only gets more and more unnerving the more the music kicks in. Featuring an edited version of the Godspeed You! Black Emperor song “East Hastings”, the pulsing bass, plodding keys, and, of course, the interweaving guitar combine to project Jim’s confusion and helplessness and help to sell the absolute terror one would face in this situation. The track has since gone on to be the de facto theme to the film series, showing up throughout this film’s sequel, 28 Weeks Later, which is also worth a look. Now you know. And knowing… You know. Fixed! How did nobody, in all this time, call me out on this? I recall having some issues a while back identifying the song, and for some reason, the John Murphy track was the only one that I was able to cite. Thanks for the correction, though!